The one thing I couldn't get enough of as a child was strawberries and whipped cream. Something about the sweetness of the berry mixed with the creamy topping was completely irresistible. So taking that combination and turning it into strawberry shortcake? Pure genius. With summer coming to an end, it's time to celebrate this beloved American dessert and make the most of the strawberry season with strawberry shortcake recipes. While you simply can't go wrong with the classic, inventive recipes like strawberry shortcake ice cream bars and strawberry shortcake kabobs are too delicious to pass up. Here to tempt you with all things strawberry shortcake, are 15 juicy recipes you need to make this summer. Don't have an ice cream machine? No worries. This No-Churn Strawberry Shortcake Ice Cream recipe gives you the flavor you want with the prepping method you need. Requiring only five ingredients - strawberries, condensed milk, heavy cream, shortcake, and vanilla extract - the hardest part about whipping this up is waiting for the ice cream to freeze. This recipe will stay in your recipe box. Whether you can't do dairy or are looking for a way to use up that can of coconut milk, everyone will love these vegan and gluten-free Strawberry Shortcake Bars this summer. Cutting out the food dyes that come with store bought crumb toppings, this wholesome recipe calls for using real freeze-dried strawberries, gluten-free cookie crumbs, vanilla, vegan butter, and full fat coconut milk. Be sure not to skimp on the full fat, too, for this great recipe. While tasty, the reduced fatcans won't offer the same creamy consistency. Strawberry desserts deserve the best cream you can make. Who said you couldn't have strawberry shortcake for breakfast? Put away the cake pan, this is a delicious upgrade from strawberry cake. With this Strawberry Shortcake Overnight Oats recipe you get the nostalgic flavors of childhood mixed with the hearty breakfast you need. Go on, dig in. Breakfast is the most important meal of the day. Fluffy pancakes stacked high with sweet strawberry sauce, juicy fresh strawberries, and a dollop of whipped cream is the weekend breakfast of choice. Make your homemade whipped cream for this version, whipping with an electric mixer until soft peaks form. To prepare, you'll need to mix all your dry ingredients in a large bowl and your wet ingredients in a medium bowl. Adding the two together, mix until thick, then dollop the batter onto a hot griddle. Next, top with your homemade strawberry sauce, strawberries, and whipped cream for an out of this world Strawberry Shortcake Pancake breakfast. More of a waffle person? We've got you covered. These Strawberry Shortcake Waffles with maple whipped cream can be whipped up in a snap. Requiring only a waffle mix, large eggs, milk, and oil for the batter, you can have these waffles ready before the kids come running for breakfast. And the whipped cream? Maple syrup and heavy whipping cream is all it takes. Keep at it until the mixture resembles a smooth, almost glossy texture. Add this to your favorite list of summer recipes. As if we didn't need another reason to indulge, Whole and Heavenly Oven has gone and given us this Strawberry Shortcake Dutch Baby recipe. Bust out that skillet because this strawberry, whipped cream, and chocolate concoction will be a summertime treat you won't want to skip. If you've not yet experienced with Dutch babies in your own kitchen, let this be the first of the new recipes you try because it's essentially foolproof. Eaten for breakfast traditionally, this will easily become one of your favorite desserts. Tired of your normal morning smoothie? Change things up and try this Strawberry Shortcake Protein Smoothie. Despite the dessert inspired name, this shake is healthy with its fresh strawberries, milk, and Greek yogurt base. To top it off, it has an extra boost of protein with Burt's Bee's plant based protein that's loaded with antioxidants. Who can say no to that? Vegan or lactose intolerant? Sub the milk and Greek yogurt for a coconut based product. When it comes to smoothies, this will be one of your new favorite recipes. 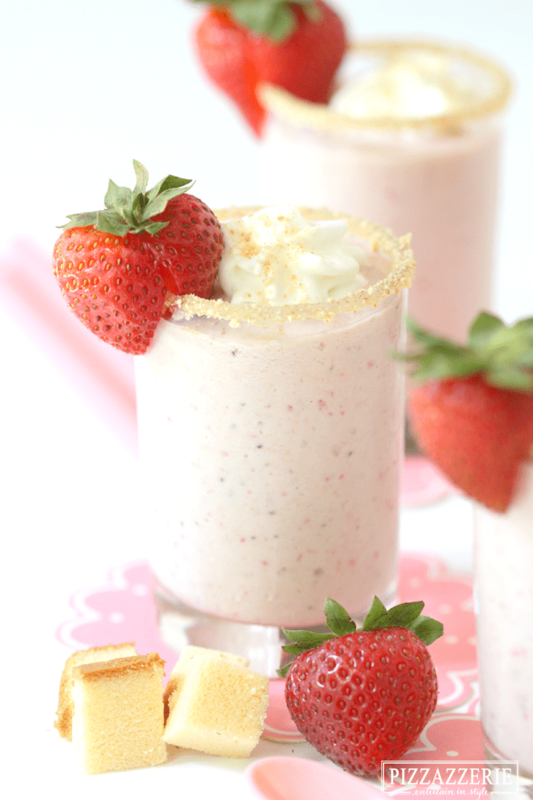 On a hot summer day, indulge the decadent way with this Strawberry Shortcake Milk Shake. Creamy vanilla ice cream, pound cake, and fresh hulled strawberries take your ordinary strawberry milk shake and turn it into a heavenly delight. Oh, and be sure to rim the glasses in honey and graham cracker crumbs for an added treat. You can have just about everything strawberry shortcake flavored, even donuts. Making donuts may sound intimidating, but with this Strawberry Shortcake Baked Mini Donut recipe you'll wonder why you've never bake donuts before. Thanks to a mini donut pan, you'll have no problem whipping up these strawberry and powdered sugar glazed strawberry shortcake donuts. Everyone loves food on a stick, that's why these Strawberry Shortcake Kabobs are the perfect dessert for your backyard barbecue. Easy to hold, and even easier to eat, these kabobs are a must. Simply skewer strawberries, shortcake bits, and drizzle with white chocolate. In a hurry? Skip the electric mixer and opt for a store bought shortcake to cut down on prepping time. With these version, you don't even need to get out the food processor or worry about coarse crumbs or baking anything until golden brown. Who doesn't love cupcakes? And a strawberry shortcake cupcake? Now we're talking. These Strawberry Shortcake Cupcakes are ideal for birthdays, parties, or a summer afternoon treat. Taking roughly 20 minutes of your time, whisk together the cupcake batter, then top with homemade vanilla frosting and ripe red strawberries. If you forget the baking powder, check out our handy list of substitutions. Strawberry Shortcake Trifles are a dinner party's dessert dream. Layers of strawberries, mouthwatering cake, and a cream cheese-based cream is screaming for your fork to dig in. The great thing about this strawberry shortcake recipe is that you can make the cake ahead of time and finish off the trifles come time for dessert. Italian meets American in this food mash-up. An inspired blend of two cultural favorites, this Strawberry Shortcake Tiramisu is the best of both worlds. Lady Fingers, whipped topping, strawberry cream cheese, and fresh strawberries layered into one delicate and delectable cake waiting to be savored. Strawberry Shortcake Cake is the decadent cake you will want to turn that oven on for. Layers of buttery vanilla cake, creamy whipped frosting, and fresh juicy strawberries take a classic and transform it into a new summer time staple. Of course, you simply can't go wrong with a Classic Strawberry Shortcake recipe. Homemade buttery biscuits stacked with a mount of ripe strawberries and homemade whipped cream is the too good to pass up.